My love letter to shopping app Spring has been a long time coming—really, ever since its launch in August. The usual tech news outlets—TechCrunch, Wired, and Re/code, to name a few—applauded Spring, but Vogue, Elle, and Fashionista have also sung its praises. It’s rare that an app can catch the attention of two big major markets right at launch, but Spring isn’t an ordinary app. Even Beyoncé has a shop on Spring. 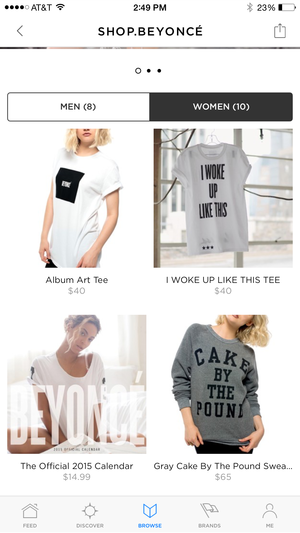 Typically, shopping for clothes on your iPhone isn’t the best experience. The items are cramped and can be hard to see, browsing is a pain, and the checkout can be anything but smooth if you have to punch out your billing and shipping info on the iPhone’s small keyboard. Spring has reconfigured the entire process, and it was ahead of the checkout curve before Apple Pay was even on our radar. That deserves major props. Think of Spring as a fashion marketplace with an Instagram-like layout: you build your own feed by following brands and designers you like. Brands control what they post and when, so you can scroll through your feed at your leisure to see what’s new. And we’re not just talking boring product shots, here—most of these images have an editorial feel, so you get the sense that you’re scrolling through a digital style magazine instead of a catalog. To check out, tap Apple Pay or Credit Card to finalize. If you don't want to store a credit card with Spring, it will go straight to Apple Pay. Spring built partnerships with brands before the app launched, so shoppers had access to a wide variety of sellers right away. That number continues to grow, with new shops being added weekly. Spring isn’t just for women’s clothing—it features men’s items, beauty and skincare products, tech accessories, jewelry, and more. It even has handy gift guides and thoughtful collections if you need some inspiration. In addition, the app takes individual style and price points into consideration—you’ll find high-end luxury labels (Helmut Lang) mixed in with emerging boutiques (Everlane) and fast fashion (Weekend Society). This is awesome if you’re more of a budget-conscious shopper, like myself—it’s kind of a bummer scrolling through a feed of amazing pieces I can’t afford, so the variety is very welcome. 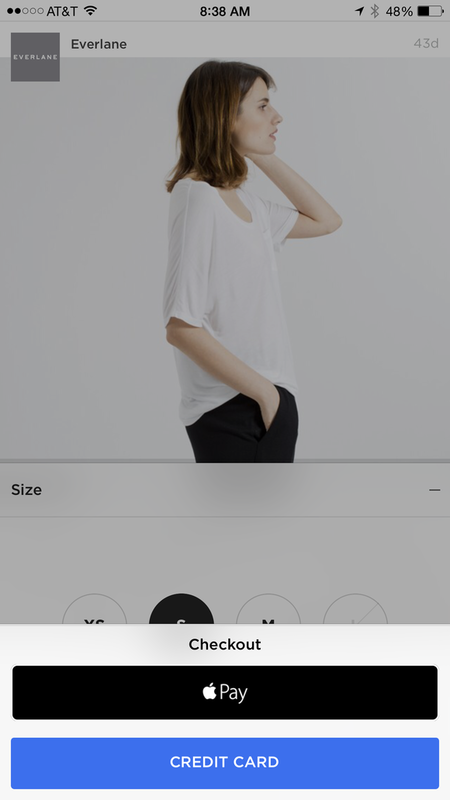 Spring also has a browsing tool that lets you filter its collection by item and price, so I can easily hide any tops that cost more than $100 (must…not…buy…everything…). But what really makes Spring the leader of the shopping pack is its checkout process. In the pre-Apple Pay days, all you’d have to do to buy an item is swipe from left to right. Now, Spring wants to make sure you know what your options are, so you’ll be prompted to enter your payment info or link Spring to Apple Pay the first time you use the app. That way, when you’re ready to buy something, you’re only three taps away: Tap Buy, enter your size, and pick how you want to pay. That’s it. No shopping cart, no arduous hunting and pecking, just near-instant retail satisfaction. Everything about Spring is mobile first; it’s clearly not just an online store that built an app as an afterthought. Before Spring launched, I’d rarely ever voluntarily shop for clothes on my phone. If I did, it was a last resort—like if I needed to buy a gift and didn’t have my MacBook handy, or if I was already out shopping and I wanted to check if an item was available at a different store. Now, it’s part of my daily app routine—not buying, of course, but scrolling through my feed, adding items to my likes, and discovering cool new shops. It’s eye candy. My one critique? It’s almost too easy. Seriously, just ask my checking account. Spring is available now in the App Store.